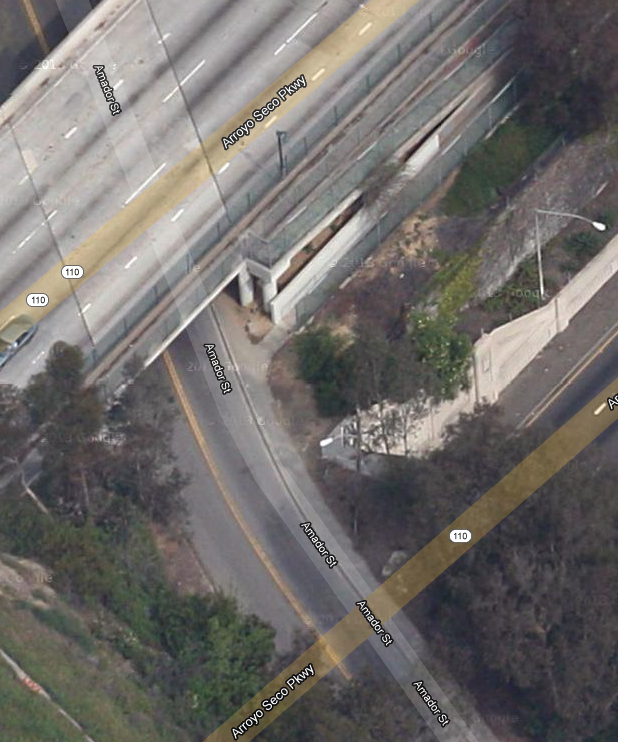 Pedestrian Access to the 110 Freeway? Wouldn’t you like to take a relaxing stroll along the oldest freeway in the world? It’s not the busiest freeway – that would be the 405 – but it’s still three or four lanes of hurtling steel. 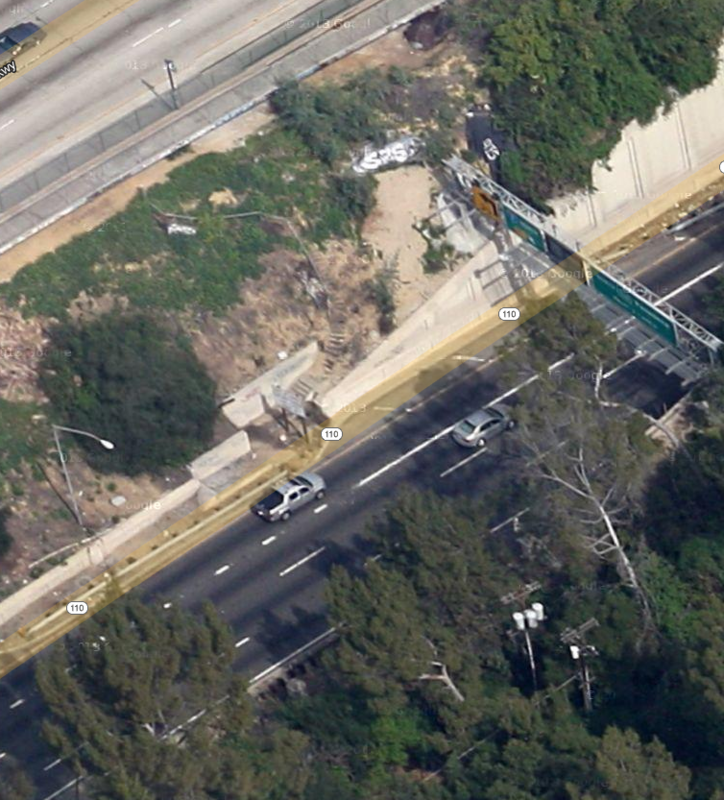 Along the east edge of the southbound side of this old freeway is a path for pedestrians, between the junction to the 5E and Amador Street. Every time I drive past, I wonder who it is intended for. I’ve never seen anyone on it. Is, or was, the City of Los Angeles so concerned for pedestrians that it provided this odd little walkway to get across the LA River? If you need to cross the river on foot, you could always go to North Broadway, and cross there on a handsome, well-maintained, sidewalk. 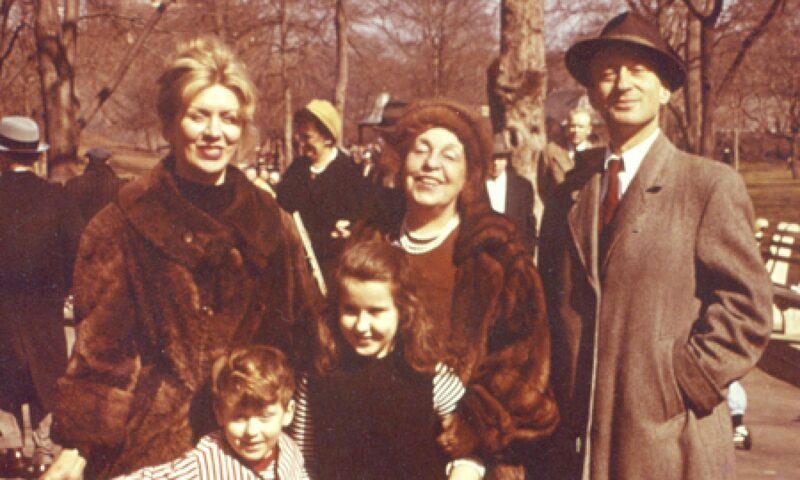 I grew up a New York pedestrian; I first crossed the street unsupervised in 1960 at the age of 4 – I wandered off while all the adults were arguing about who was late and who was being a nudge. By the time they noticed that I was gone, I had already wandered into traffic on West End Avenue. They all came pouring out onto 72nd Street screaming my name. Someone shouted, “there he is!” and ran after me and scooped me up. It was very gratifying and exciting. In the 60s and 70s, New York streets were dicey, and I developed street instincts, like 360-degree awareness, crazy-person avoidance, youth-looking-for-a-fight detection, and continual monitoring for escape routes. 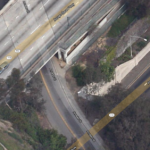 This last skill would make me avoid this walkway along the 110, because there’s no way to run if two rival gangs approach each other in a deadly standoff. At least on the Broadway bridge, you could run perpendicularly into traffic, and take your chances with the trucks. 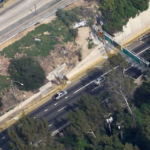 I’ve been commuting from West LA to Pasadena for five months now (and for an additional eleven months about two years ago), and I’ve become obsessed with these strange, ramshackle staircases that go down to the freeway, snaking through the brush. Some of them, like the one on Solano Avenue, seem to serve the purpose of allowing pedestrian traffic to cross the freeway. 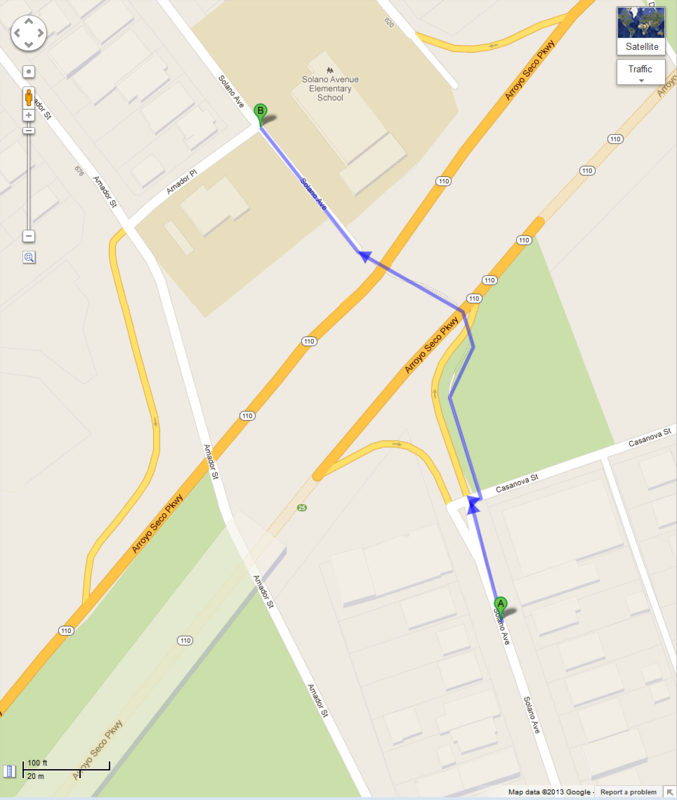 There’s a school nearby, and it makes sense to let the students who live just 150 feet across the freeway walk across. 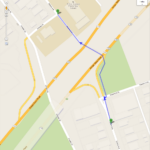 Google Maps seems to think you can do that, but when I look at the satellite view, I don’t see a path. When I drive past, I get a glimpse of a railed-off walkway… I’ll just have to go there and take a look. I see how you can walk to Amador St, which crosses above the northbound side of the 110, and then under the southbound side. But where’s the fun in simply walking along an ordinary street, when you can walk on a barely used, falling apart, dangerous narrow path that is separated from speeding traffic by a chainlink fence? And that’s probably populated by fringe elements of society? Maybe I could even do it with a nice camera around my neck? Hmmmm… That’s so smart! The entrance on Amador Street (see pic) – that one looks the best maintained, and like it might actually be intended for use. The staircase rising from Solano Avenue, near the elementary school, right by a blocked-off entrance ramp which went from a city street into the fast lane in the space of about 20 feet; it must have been a bloodbath until they fenced it off. 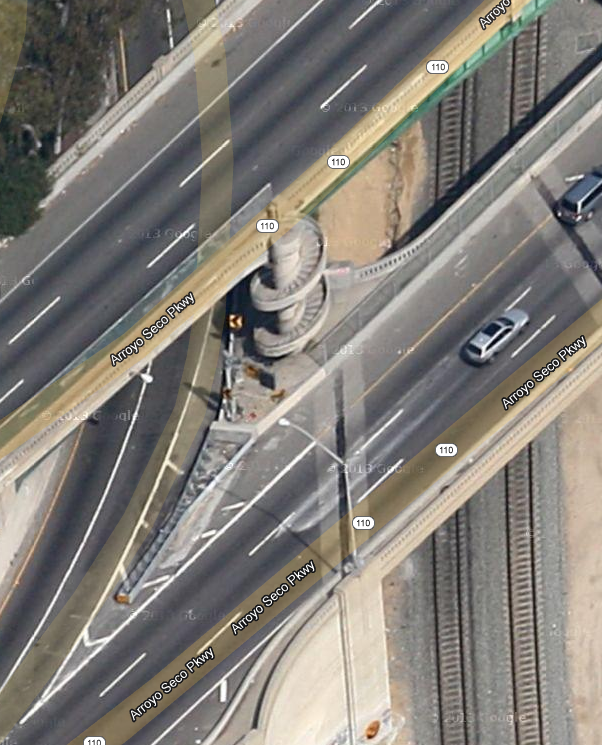 The extremely weird staircase (see pic) which goes down to the fast lane of the 110N, just before the tunnel south of the exit to the 5N; why is there a staircase there? Has ANYONE ever used it? Maybe, just maybe, if you broke down right exactly there it would allow you to flee; but if you broke down even 20 feet away, I don’t see how it would help. I would love to know the chain of reasoning that led to its construction; someone had to allot money for this thing. Finally, the last entrance I can see is if you get on North Figueroa Street, where it crosses the Los Angeles River, walk south along the east side of the road, then turn sharply left along the ramp going from the 110N to the 5N (you have to turn left; your only alternative is to dive into oncoming traffic); keep walking, and then where the ramp meets up with the 110N, there is a spiral staircase climbing up to the walkway along the 110S. 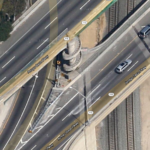 Only thing is, because the City of Los Angeles Cares About Your Safety™, to do that last maneuver you have to climb over a barrier at the south end of North Figueroa Street. It’s obviously illegal, and rightly so – completely unsafe. This is the total reboot of peterbasch.com. One day this may be used to market the photographs of Peter Basch, my late father, the photographer. Or, maybe I’ll use it to post opinions… god knows, this is probably more secret than if I wrote them in a notebook and then buried it in the crawlspace. I do have to be careful – I have a professional life that I don’t want to jeopardize with some stupid rant. So don’t expect saucy photographs… unless they’re my dad’s. I might post those. Cheerful little thing, wasn’t I?